Immune dysfunction may contribute to tumor progression in gastric cancer (GC) patients. One mechanism of immune dysfunction is the suppression of T cell activation and impairment of the efficacy of cancer immunotherapy by myeloid-derived suppressor cells (MDSCs). We assessed the phenotype and immunosuppressive function of MDSCs in GC patients. We further investigated the role of S100A8/A9 in GC and the relationship between S100A8/A9 and MDSC function. Lastly, the effect of MDSCs on survival rates and its potential as a prognostic factor in GC patients were investigated. MDSCs from PBMCs of GC patients were identified by comparing the expression of specific surface markers with PBMCs from healthy individuals. The ability of MDSCs to suppress T lymphocyte response and the effect of S100A8/A9 and RAGE blocking were tested in vitro by (autologous) MLR. GC patients had significantly more MDSCs than healthy individuals. These MDSCs suppressed both T lymphocyte proliferation and IFN-γ production and had high arginase-I expression. Levels of S100A8/A9 in plasma were higher in GC patients compared with healthy individuals, and they correlated with MDSC levels in the blood. Blocking of S100A8/A9 itself and the S100A8/A9 receptor RAGE on MDSCs from GC patients abrogated T cell effector function. We found that high levels of MDSCs correlated with more advanced cancer stage and with reduced survival (p = 0.006). S100A8/A9 has been identified as a potential target to modulate antitumor immunity by reversing MDSC-mediated immunosuppression. Myeloid-derived suppressor cells (MDSCs) are a heterogeneous population of immature myeloid cells. Their frequency is increased in the peripheral blood, lymph nodes, and bone marrow, as well as at the tumor sites in animal tumor models (1, 2) and in human cancers (3–5). They were shown to play an important role in tumor-associated immune suppression. MDSCs are recruited and activated by tumor-derived cytokines and growth factors, such as GM-CSF, G-CSF, IL-2, IL-6, IL-1β, PGE2, SCF, and VEGF (6, 7). In mice, MDSCs are classified as either monocytic by expression of CD11b+Ly6G−Ly6Chigh(Gr-1low) or granulocytic by expression of CD11b+Ly6G+Ly6Clow(Gr-1high) (8, 9). Human MDSCs are similarly classified into CD14+ monocytic MDSCs or CD15+ granulocytic MDSCs. Human MDSCs also express common myeloid markers CD11b and CD33 but lack HLADR and other surface markers for lymphoid cells (CD3/CD19/CD56) (4, 5, 10, 11). CD11b+CD14−CD15+HLADR− cells with a granulocytic morphology were reported in patients with metastatic renal cell carcinoma (RCC) (5) and nonsmall cell lung carcinoma (12). CD14+CD11b+HLADR−/low MDSCs exhibiting monocytic morphology were reported in melanoma (4), hepatocellular carcinoma (13), and ovarian carcinoma (14), suggesting that different human tumors induce different subtypes of MDSCs. Both types of MDSCs use a variety of mechanisms, including cysteine deprivation (15), generation of reactive oxygen (16, 17), increased metabolism of the amino acid l-arginine by arginase-I (arg-I) (18, 19) and NO synthetase-2 (20, 21), and induction of T regulatory cells (13), to suppress T lymphocyte activation and function. S100A8/A9 is a proinflammatory heterodimer produced by both myeloid and tumor cells (22). S100A8/A9 are elevated in inflammatory diseases, such as rheumatoid arthritis, cystic fibrosis, and inflammatory bowel disease (23–25). In addition, they are upregulated in cancers, such as hepatocellular carcinoma (26), breast cancer (27), ovarian cancer (28), and gastric cancer (GC) (29). S100A8/A9 mediates their effects by binding to cell surface receptors, such as heparan sulfate (30), TLR4 (31), and carboxylated N-glycans expressed on RAGE (32, 33), on immune cells and tumor cells. Previous studies suggested that TLR4 plays a more dominant role as a receptor for S100A8/A9 in pathological conditions, such as sepsis and autoimmunity, whereas RAGE is postulated to be the primary mediator in tumor immunity (34). S100A8/A9 was reported to be essential for MDSC accumulation in tumor-bearing mice, and the number of these S100A8/A9+ MDSCs increases with tumor load (35). It was also demonstrated that S100A8/A9 is synthesized and secreted by MDSCs in an autocrine inflammatory loop. In the mouse model, S100A8/A9 was shown to be important in the suppression of dendritic cell function, resulting in the accumulation of MDSCs in the tumor and in the peripheral blood (36). However, the potential relationship between MDSCs and S100A8/A9 in human cancer patients has yet to be explored. Because S100A8/A9 proteins are elevated in inflammation and cancer, we hypothesized that they may contribute to the suppression activity of MDSCs in GC patients. In this study, we identified and characterized MDSCs in GC patients and studied their suppressive function and their relationship with patient prognosis. In addition, we showed that S100A8/A9 is elevated in the plasma of GC patients and is expressed in GC cells, in GC infiltrating myeloid cells, and in MDSCs in the peripheral blood of GC patients. We then extended our observations to show that S100A8/A9 plays a role in MDSC accumulation and function in GC patients. With Institutional Review Board approval, 40 GC patients and 20 age-matched healthy donors (HDs) were recruited from the Singapore General Hospital. Twenty milliliters of blood was drawn from cancer patients either pregastrectomy or prior to commencement of chemotherapy. According to American Joint Committee on Cancer clinical cancer stage, 13 patients were stage I/II, and 27 patients were stage III/IV. PBMCs were isolated from freshly obtained blood by density gradient centrifugation (Ficoll–Hypaque; GE). Plasma was collected and stored at −80°C until further analysis. To determine the frequency and phenotype of MDSCs in freshly isolated PBMCs, multicolor FACS analysis was done using the following Abs (eBioscience): CD14, HLADR, CD11b, CD15, CD33, lineage-specific mixture (CD3, CD19, and CD56), and their respective isotype controls. Cells were acquired using Cyan ADP flow cytometry (Beckman Dickinson), and ≥500,000 live cells were collected to obtain reliable data using LIVE/DEAD Fixable Dead Cell Stain (Invitrogen, Carlsbad, CA). The expression of TCR-ζ on T cells in CD14−CD11b+ MDSCs was checked using anti TCR-ζ Ab (Beckman Coulter) by flow cytometry. Data were analyzed using FlowJo software (TreeStar). Results are expressed as the percentage of positive cells and mean fluorescence intensity (MFI). Using the Abs listed above, PBMCs were stained, and CD3−CD19−CD56−HLADRlowCD11b+CD33+CD15+CD14− cells were sorted using a BD FACSAria II cell sorter. The sorted cells were fixed with methanol and immersed in Field’s A Solution and Field’s B Solution. Cells were visualized under the microscope at 40× and 100× magnification. CD14−CD11b+ MDSCs were isolated from PBMCs using MACS magnetic bead isolation kits (Miltenyi Biotec), according to the manufacturer’s instruction. First, CD14+ cells were removed by positive selection using CD14 MicroBeads. Subsequently, CD14−CD11b+ cells were isolated from the CD14− cell fraction with anti-CD11b MicroBeads. For coculture experiments, autologous T cells were isolated from PBMCs using a Pan T cell isolation kit II. The purity of the cells after sorting was >90%. For the T cell–proliferation assay, freshly sorted CD14−CD11b+ MDSCs were cocultured with autologous CD3+ T cells for 5 d. Briefly, T cells (100,000/well) were incubated with CFSE (Invitrogen, Molecular Probes) at a final concentration of 1 μM for 10 min at 37°C. Cells were washed three times with ice-cold complete RPMI 1640 and stimulated in anti-CD3 and anti-CD28 (both from eBioscience), 10 μg/ml each precoated per well of 96-well round-bottom plates. No MDSCs or 50,000 (1:2), 25,000 (1:4), or 12,500 (1:8) MDSCs were added to the stimulated T cells. After 5 d, cells were harvested, stained with anti-CD3, anti-CD4, anti-CD8, anti–TCR-ζ (all from eBioscience), and Aqua LIVE/DEAD dye (Invitrogen). 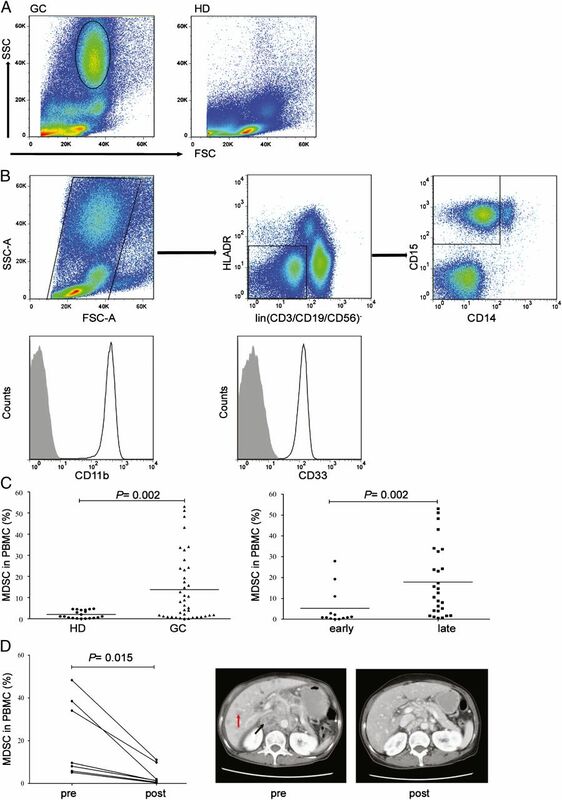 The change in CFSE signal of gated CD3+ T cells was measured as fluorescence intensity by flow cytometry. In some experiments, MDSCs were treated with monoclonal anti-S100A8/A9 Ab (5 μg/ml; Acris Abs) and anti-RAGE Ab (5 μg/ml; R&D Systems) for 1 h at 37°C before coculture with autologous T cells. Cytokine production was determined in the supernatant by ELISA using an IFN-γ OptEIA kit (BD Bioscience). Total RNA was extracted from sorted CD14−CD11b+ MDSCs using TRIzol reagent (Invitrogen). After quantification of RNA, cDNA was synthesized using a SuperScript II Reverse Transcriptase kit (Invitrogen), according to the manufacturer’s protocol. mRNA was quantified by real-time PCR (SYBR Green PCR Master Mix; Applied Biosystems) using the 2−ΔΔCt method, in which Ct represents the threshold cycle (ABI 7500 Prism Detection System; Applied Biosystems). Relative gene expression was determined by normalizing the gene expression of each target gene to GAPDH. The following primers were used to amplify arg-I, inducible NO synthase (iNOS), and GAPDH: arg-I forward, 5′-GTTTCTCAAGCAGACCAGCC-3′ and reverse, 5′-GCTCAAGTGCAGCAAAGAGA-3′; iNOS forward, 5′-ATTCTGCTGCTTGCTGAGGT-3′ and reverse, 5′-TTCAAGACCAAATTCCACCAG-3′; and GAPDH forward, 5′-TTAAAAGCAGCCCTGGTGAC-3′ and reverse, 5′-CTCTGCTCCTCCTGTTCGAC-3′. Isolated MDSCs were lysed at 4°C with radioimmunoprecipitation assay buffer in the presence of protease inhibitors. The cell extracts were then centrifuged at 12,000 × g for 20 min, and the protein concentration was measured. A total of 30 μg cell lysates was electrophoresed in 10% Tris-glycine gels and transferred to polyvinylidene difluoride membrane. After blocking overnight with 5% dry milk in TBS-T (50 mM Tris-HCl [pH 7.4], 150 mM NaCl, 0.1% Tween-20), the membranes were incubated with mouse anti-human arg-I, iNOS, S100A8, S100A9, and RAGE Abs, followed by anti-mouse or anti-rabbit Ab conjugated with HRP (Santa Cruz Biotechnology, Santa Cruz, CA). Chemiluminescence of protein bands was detected using the Luminata Classico Western HRP Substrate Kit (Millipore, Bedford, MA). S100A8/A9 (Hycult Biotech) was measured from plasma and from MDSC–T cell cocultured supernatant using an ELISA kit, in accordance with the manufacturer’s protocol. Paraffin blocks of tissue section were sliced and stained with anti-CA19.9, anti-CD11b, anti-S100A8, and anti-S100A9 (Santa Cruz Biotechnology) and detected using the Dako REAL EnVision+ HRP System and a peroxidase substrate AEC kit (SPD Scientific). Images were scanned and evaluated by two independent observers who were blinded to the clinicopathologic information. Comparisons of MDSC percentages and the plasma S100 concentration between GC patients and HDs were made using a nonparametric (Mann–Whitney or Wilcoxon-rank) test. The two-tailed Student or paired t test was used to compare results from in vitro experiments. All analyses were performed at a significance of 5% (p ≤ 0.05). Relationships between two parameters were investigated using the Pearson rank-correlation test. Exploratory univariate and multivariate Cox proportional hazards regression with stepwise variable models was used to evaluate the percentage of MDSCs and the effects of S100 levels and the cancer stage on overall survival. Different subsets of MDSCs have been associated with different types of cancers. MDSCs were previously characterized in RCC patients to be lineage (lin) markers (CD3/CD19/CD56)−HLADR−CD33+ (37, 38), as well as CD14−CD11b+CD15+ (5), with granulocytic morphology and in melanoma patients to be CD14+HLDR−CD11b+ (4) with monocytic morphology. To determine which MDSC types are present in GC patients, PBMCs from GC patients and age-matched HDs were stained with a combination of lin Ab mixture (CD3/CD19/CD56)-, HLADR-, CD11b-, CD33-, CD14-, and CD15-specific Abs and analyzed by flow cytometry. As shown in Fig. 1A, a distinct cell population with high side scatter (SSC) profile was observed in GC patients but not in HDs. Initial flow analysis was carried out based on the previous report that MDSCs are lin (CD3/CD19/CD56)−HLADR−CD33+ (a), CD14−CD11b+CD15+ (b), or CD14+HLDR−CD11b+ (c). We observed all of these phenotypes in GC patients (Supplemental Fig. 1A). In addition, we found another phenotype that expressed a similar phenotype (CD15+) as RCC (37) but with higher forward and side scatter (CD15+FSChiSSChi) (d) (Supplemental Fig. 1A). When each of the MDSC populations was calculated as a percentage of total PBMCs, a significant increase in MDSC (a) (12.50 ± 2.56%), MDSC (b) (15.25 ± 2.60%), and MDSC (d) (17.62 ± 2.79%) was seen compared with HD MDSC (a) (2.93 ± 0.32%; p < 0.0001), MDSC (b) (2.61 ± 0.45%; p = 0.005), and MDSC (d) (3.39 ± 0.40%; p = 0.004) (Supplemental Fig. 1B). In contrast, CD14+HLDR−CD11b+ MDSCs were not significantly different between the GC patients (1.13 ± 0.26%) and the HDs (1.28 ± 0.42%) (Supplemental Fig. 1C). To be more specific with regard to MDSC phenotyping, we gated the PBMC population based on its expression of lin markers and HLADR. Thus, this population consisted of lin (CD3/CD19/CD56)−HLADRlow cells. From this population, the fraction of cells that was CD14−/low and CD15+ was determined. Analysis showed that these lin (CD3/CD19/CD56)−HLADRlowCD14−/lowCD15+ cells were CD11b+ and CD33+ (Fig. 1B). When this population (lin−HLADRlowCD14−/lowCD15+CD11b+CD33+) was FACS sorted and stained with Giemsa, it exhibited a polymorphonuclear morphology (Supplemental Fig. 1D). Therefore in our study, MDSCs were defined as lin−HLADRlowCD14−CD15+CD11b+CD33+, hereafter referred to as CD14−CD11b+ MDSCs. These CD14−CD11b+ MDSCs were significantly more prevalent in GC patients (13.75 ± 2.50%, n = 40) compared with HDs (2.01 ± 0.41%, n = 20; p = 0.002) (Fig. 1C, left panel). In addition, we found a correlation between cancer stage and the percentage of CD14−CD11b+ MDSCs in PBMCs: higher levels of MDSCs were found in patients with stage III or IV disease (17.85 ± 3.23%, n = 27) compared with those with an early stage (i.e., stage I or II) of disease (5.23 ± 2.44%; n = 13; p = 0.002) (Fig. 1C, right panel). In seven patients with stage IV disease who had undergone three courses of chemotherapy, the frequency of MDSCs in the PBMCs was significantly lower compared with before chemotherapy was administered (3.77 ± 1.74 versus 21.35 ± 6.90, p = 0.015) (Fig. 1D, left panel). It was noteworthy that these patients also showed a radiographic response to chemotherapy. Representative radiographic scans of one patient with metastasis to the lymph nodes (black arrow) and liver (red arrow) are shown in Fig. 1D (middle and right panels). Identification and characterization of a highly granular population of cells found in freshly isolated PBMCs from GC patients. (A) Using flow cytometry, a distinct high SSC cell population was observed in PBMCs from GC patients but not in PBMCs from HDs. (B) The cells were first gated based on the expression of lin markers (CD3/CD19/CD56) and HLADR. Subsequently, the lin(CD3/CD19/CD56)−HLADR−/low population was gated for CD14− and CD15+ fractions, followed by CD11b and CD33 staining with respect to isotype control (filled graphs). (C) The frequency of CD14−CD11b+ MDSCs was increased in PBMCs of GC patients (n = 40) compared with HDs (n = 20) (left panel). Increased levels of CD14−CD11b+ MDSCs were seen in patients with late-stage disease (stage III or IV) compared with those with early-stage disease (stage I or II) (right panel). The horizontal lines denote mean values. (D) The frequency of CD14−CD11b+ MDSCs in the PBMCs from stage IV GC patients pre- and postchemotherapy (n = 7; left panel). Radiographic scans of a GC patient with metastasis to liver (red arrow) and lymph node (black arrow) prechemotherapy (middle panel) and postchemotherapy (right panel). One of the characteristics of MDSCs is their ability to suppress T cell activation. Sorted CD14−CD11b+ MDSCs (Supplemental Fig. 2A) were cocultured with anti-CD3/CD28–stimulated autologous CD3+ T cells at different ratios (0:1; 1:8; 1:4; and 1:2). MDSC populations were FACS sorted from the blood of three GC patients and HDs. MDSCs from all patients efficiently suppressed the proliferation of T cells. Although the MDSCs purified from HDs were also able to suppress T cell proliferation, the suppressive effect was less pronounced than in GC patients (Fig. 2A, 2B, left panels). This suppressive activity occurred in a dose-dependent fashion for both GC patients and HDs (Fig. 2B, left panel). In addition, CD14−CD11b+ MDSCs from GC patients and HDs inhibited the production of IFN-γ by T cells (Fig. 2B, right panel). However, GC MDSCs showed enhanced suppression of IFN-γ production relative to HD MDSCs at each corresponding dose ratio. TCR-ζ is a marker of T cell activation on CD8+ T cells. In autologous MLR experiments (Fig. 2C), we demonstrated that the expression of TCR-ζ on CD8+ T cells was downregulated when cocultured with CD14−CD11b+ MDSCs compared with CD8+ T cells cultured alone (MFI of T cells cocultured with MDSCs: 46.80 ± 5.25 versus 68.10 ± 6.40 for T cells alone, n = 6, p < 0.05). Therefore, these results confirm that the MDSCs that we identified possess immune-suppressive function. Suppression of T cell proliferation and IFN-γ production by CD14−CD11b+ MDSCs. Sorted CD14−CD11b+ MDSCs were cocultured with autologous CD3+ T cells stimulated with anti-CD3/anti-CD28 at different ratios (0:1, 1:8, 1:4, or 1:2) for 5 d. (A) CFSE fluorescence intensity of live CD3+ T cells alone or cocultured with MDSCs from HDs (top panels) or GC patients (bottom panels). CFSE fluorescence intensity at the start of culture (undivided cells) is represented by the filled graphs and that after culture (divided cells) is indicated by the open graphs. T cell proliferation was analyzed by the conventional method of gating on the proliferated cells (shifted to the left after stimulation). Data are from one of three independent experiments. (B) T cell proliferation was quantified as the percentage of CFSE dilution (mean increase in percentage of divided cells) of gated CD3+ T cells after stimulation. Normalized CFSE flow quantification of T cell proliferation with CFSE fluorescence signals from T cells alone were taken as 100% for both sample groups of three GC patients (black circles) and three HDs (gray squares) (left panel). Supernatant from cocultures of autologous T cells with GC MDSCs and HD MDSCs was measured for IFN-γ production by ELISA (right panel). Similarly, the amount of IFN-γ produced by proliferated T cells after stimulation, but in the absence of MDSCs, was set as 100%. Values are expressed as mean ± SEM of three individual experiments. One-way ANOVA was used to analyze the difference in means between the sample groups. (C) Expression of TCR-ζ–chain on CD8+ T cells was analyzed by flow cytometry on autologous T cells after coculture with CD14−CD11b+ MDSCs. Data are the average relative MFI from six GC patients. 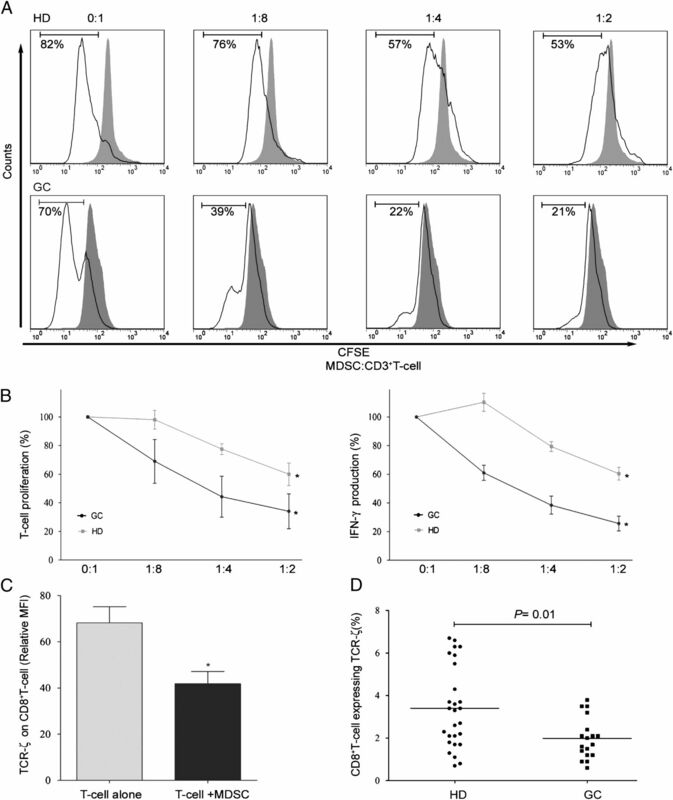 (D) PBMCs from GC patients and HDs were analyzed for the percentage of total CD8+ T cells expressing TCR-ζ. GC patients (n = 18) had a lower percentage than HDs (n = 27). *p < 0.05. Having shown that the expression of TCR-ζ on CD8+ T cells was downregulated by MDSCs in vitro, we examined the expression of TCR-ζ on CD8+ T cells in GC patients. The percentage of CD8+ T cells expressing TCR-ζ was lower in GC patients compared with HDs (1.98 ± 0.22% versus 3.40 ± 0.36%, p = 0.01) (Fig. 2D). The level of expression of TCR-ζ on CD8+ T cells from GC patients was also significantly lower compared with HDs (MFI: 22.73 ± 4.25 versus 42.01 ± 8.12, p = 0.043) (Supplemental Fig. 2B). This result, together with T cell suppression, suggests that the ability of MDSCs from GC patients to induce a greater suppressive effect on T cell function could be attributed to the enhanced downregulation of TCR-ζ on T cells compared with HDs. MDSCs exert their immunosuppressive activity through multiple mechanisms, one of which is l-arginine depletion. 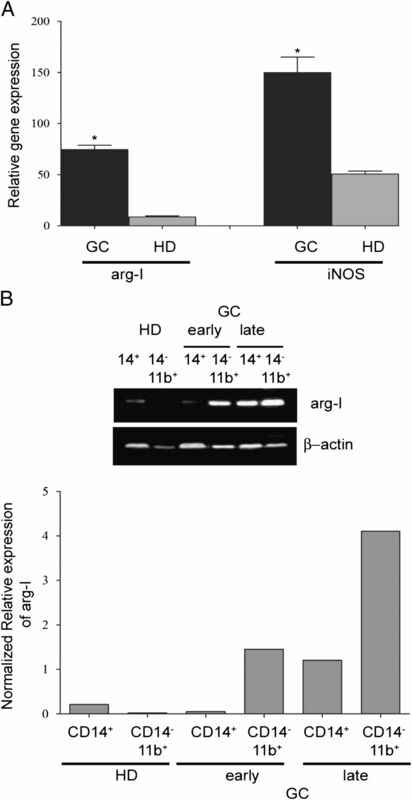 Two enzymes that deplete arginine, arg-I (19) and iNOS (21), were shown to inhibit T cell function. Therefore, we tested for the expression of arg-I and iNOS molecules in CD14−CD11b+ MDSCs. Real-time PCR showed that arg-I and iNOS were expressed at significantly higher levels in the MDSCs from GC patients compared with HDs (Fig. 3A). Overexpression of arg-I was observed in MDSCs from GC patients, but not in HDs, by Western blot (Fig. 3B, top panel). In late-stage GC patients, CD14+ monocytes were also observed to express arg-I, albeit at a lower level than the CD14− MDSCs (Fig. 3B, bottom panel). Arg-I was increased to 2–4-fold in MDSCs, regardless of early- or late-stage GC, versus HDs (Fig. 3B, bottom panel). We did not find any iNOS protein expression in MDSCs from GC patients by Western blot (data not shown). This could reflect differential posttranscriptional or translational regulation of different suppressive enzymes in different subsets of MDSCs. Considering that the MDSCs in GC patients are granulocyte-like, granulocyte–MDSCs tend to express primarily arg-I and reactive oxygen species to inhibit T cell function in RCC patients (5, 38). Nevertheless, higher levels of arg-I expression in MDSCs from GC patients compared with HDs may help to explain the greater suppressive function of MDSCs from GC patients. MDSCs sorted from PBMCs of GC patients express arg-I. (A) Higher gene-expression levels of arg-I and iNOS are found in CD14−CD11b+ MDSCs from GC patients compared with HDs (n = 5). (B) Western blot analysis of arg-I expression in CD14−CD11b+ MDSCs and CD14+ monocytes from early- and late-stage GC patients and HDs (top panel). Normalized relative expression of Western blot bands is calculated by setting one band as 1 (bottom panel). Data are representative of three biological replicates. *p < 0.05. The proinflammatory molecule S100A8/A9 was shown to induce the formation of MDSCs, and the frequency of S100A8/A9+ MDSCs was found to increase with tumor load (35). We found a significant increase in the plasma levels of S100A8/A9 in GC patients compared with HDs (93.16 ± 6.56 ng/ml [n = 40] versus 52.78 ± 5.01 ng/ml [n = 20], p = 0.005) (Fig. 4A, left panel). This increase correlated with cancer stage: GC patients with stage III or IV cancer had higher levels of plasma S100A8/A9 compared with those with stage I or II cancer (108.00 ± 7.30 ng/ml [n = 27] versus 62.33 ± 8.58 ng/ml [n = 13], p = 0.032) (Fig. 4A, right panel). Interestingly, we also saw a positive correlation between the numbers of CD14−CD11b+ MDSCs and plasma S100A8/A9 levels (r = 0.579, p < 0.001) (Fig. 4B). This result suggests that S100A8/A9 may be associated with production of MDSCs in GC patients. The role of S100A8/A9 in MDSC activity in GC patients. (A) Plasma level of S100A8/A9 was higher in GC patients (n = 40) than in HDs (n = 20) (left panel). Significantly higher levels of plasma S100A8/A9 were seen in late-stage (n = 27) compared with early-stage (n = 13) GC patients (right panel). The horizontal lines denote mean values. (B) A positive correlation was observed between the plasma level of S100A8/A9 and the percentage of CD14−CD11b+ MDSCs in GC patients (n = 40). (C) S100A8/A9 protein expression in malignant cells (black arrows) and in stromal cells (red arrows) from GC tumor tissue by immunohistochemistry (original magnification ×400) (left and middle panels). S100A8 and S100A9 expression in CD14−CD11b+ MDSCs from early- and late-stage GC patients and HDs by Western blot (right panel). CD14+ monocytes from both GC patients and HDs served as a positive control. (D) S100A8/A9 concentration was measured, using ELISA, from the supernatants of MDSCs alone or MDSCs cocultured with T cells from both GC patients and HDs. Data are mean ± SEM of four independent experiments for each sample group. *p < 0.05. NS, No stimulation. S100A8/A9 is produced by both myeloid and tumor cells (22). We show by immunohistochemistry that GCs express S100A8 and S100A9 (Fig. 4C, left and middle panels). Expression was seen in both malignant cells (black arrows) and in stromal cells (red arrows) with a myeloid phenotype (Supplemental Fig. 3A). We then isolated MDSCs from the peripheral blood of GC patients and found S100A8 and S100A9 protein to be constitutively expressed in these MDSCs (Fig. 4C, right panel), indicating that a potential source of S100 proteins in GC patients could be the MDSCs themselves. Expression of S100A8 and S100A9 was also observed in HDs but at lower levels (Supplemental Fig. 3B). In tumor-bearing mice, S100A8/A9 is synthesized and secreted by MDSCs and binds to the cell surface receptor RAGE, resulting in signaling within MDSCs and their migration (35). Because S100A8/A9 protein is expressed by MDSCs (Fig. 4C, right panel), it might be involved in an autocrine loop to potentiate MDSCs’ suppressive activity, in addition to its role in MDSC migration. To test this possibility, we measured the levels of S100A8/A9 secreted into cell culture supernatants in an MLR assay. MDSCs cocultured with autologous T cells secreted significantly higher amounts of S100A8/A9 compared with T cells cultured alone or MDSCs cultured alone (Fig. 4D). Secretion of S100A8/A9 by MDSCs was significantly higher in GC patients compared with HDs. We next examined the effect of anti-S100A8/A9 or control IgG (5 μg/ml) Abs on MDSC suppressive activity. Treatment with anti-S100A8/A9 Ab reversed the suppressive effect of MDSCs on T cell function, as assessed by T cell proliferation (Fig. 5A, left panel, Supplemental Fig. 3C) and IFN-γ production (Fig. 5A, right panel) compared with no treatment and control IgG. This result, together with the data that MDSCs could secrete S100A8/A9 (Fig. 4D), suggests that they have the capacity to respond to S100A8/A9 proteins, and they may also upregulate their production via a positive-feedback loop. 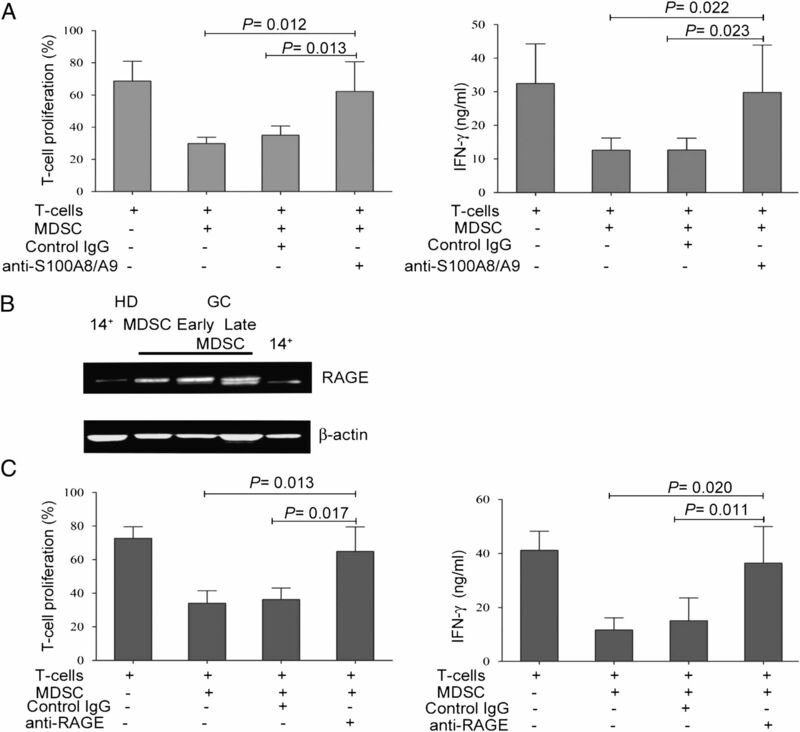 MDSC-mediated T cell inhibition can be reversed by anti-S100A8/A9 and anti-RAGE Ab. (A) CD14−CD11b+ MDSCs mediated suppressive activity on T cell proliferation (mean increase in percentage of divided cells) (left panel), and IFN-γ production (right panel) was reversed by the addition of anti-S100A8/A9 blocking Ab (5 μg/ml) compared with the addition of IgG control Ab or no Ab. Values are mean ± SD of triplicate wells in a single experiment. Data are an average of five independent experiments. (B) RAGE expression in CD14−CD11b+ MDSCs from early- and late-stage GC patients and HDs by Western blot. CD14+ monocytes from both GC patients and HDs served as a positive control. (C) CD14−CD11b+ MDSCs mediated suppressive activity on T cell proliferation (mean increase in percentage of divided cells) (left panel), and IFN-γ production was reversed by the addition of anti-RAGE blocking Ab (5 μg/ml) compared with the addition of IgG control Ab or no Ab (right panel). Values are presented as mean ± SD of triplicate wells in a single experiment. Data are an average of five independent experiments. RAGE is a receptor for S100A8/A9 on myeloid cells through which S100A8/A9 would act (32). MDSCs from both GC patients and HDs contain RAGE receptor (Fig. 5B). To determine whether RAGE plays a role in supporting the immune-suppressive properties of MDSCs, MDSCs from GC patients were treated with a RAGE-blocking Ab (5 μg/ml). Indeed, blocking RAGE reversed the suppressive effect of MDSCs on T cell function, as assessed by T cell proliferation (Fig. 5C, left panel, Supplemental Fig. 3D) and IFN-γ production (Fig. 5C, right panel). This result is consistent with a previous report demonstrating that S100A8/A9 played a role in the accumulation of MDSCs in mice through binding to cell surface receptors expressing carboxylated glycans (35). We showed that S100A8/A9 in GC patients also plays a role in the suppressive activity of MDSCs, and this activation may be mediated by binding to RAGE. Increased MDSC numbers inversely correlated with overall survival of GC patients. Having established that MDSCs are present in significantly higher numbers in GC patients and that there is a correlation between tumor stage and the frequency of MDSCs in GC, we sought to correlate their numbers with the survival of GC patients. GC patients (n = 40) were divided into two groups based on whether they had >4% or <4% of MDSCs in PBMCs. We chose 4% as the cut-off, because the percentage of MDSCs in HDs falls within 4% in our study. Patients (n = 23) with ≥4% MDSCs exhibited a significantly shorter survival time compared with patients (n = 17) with <4% MDSCs (p = 0.024) (Fig. 6A). A similar analysis was carried out for the 27 patients with stage III or stage IV cancer. Although more patients with <4% MDSCs (n = 7) survived compared with those with ≥4% MDSCs (n = 18), this difference did not reach statistical significance (p = 0.166) (Fig. 6B). Analysis of the overall survival of GC patients with either high or low MDSC frequency. (A) A significant difference in overall survival of GC patients was found between those with a normal MDSC frequency (<4%) and those with a high MDSC frequency (≥4%). (B) No significant difference in overall survival of late-stage GC patients was found between those with a normal MDSC frequency (<4%) and those with a high MDSC frequency (≥4%). We then went on to examine factors that may be associated with patient survival. Univariate Cox proportional-hazard analysis revealed that the frequency of CD14−CD11b+ MDSCs was the sole parameter significantly associated with prognosis (p = 0.006). Neither the levels of plasma S100A8/A9 (p = 0.163) nor the cancer stage (late versus early) (p = 0.096) correlated significantly with prognosis (Supplemental Table I). Multivariate analysis showed that the frequency of CD14−CD11b+ MDSCs remained significantly associated with prognosis, even when S100A8/A9 plasma levels and cancer stage were included (data not shown). GC is the second most common cause of cancer deaths in the world (39). The prognosis for patients with advanced GC remains poor, despite preoperative or adjuvant chemotherapy (40). This may be due to a systemic immune-modulatory effect that the cancer exerts on patients. Therefore, identification and characterization of the immune-modulatory factors in GC patients may aid in their treatment. MDSCs are immune-modulatory cells that exhibit suppressive activities on adaptive immunity and aid tumor progression and metastasis (41). In this study, we identified and characterized the MDSC population in GC patients and found a strong inverse correlation between these MDSC numbers and patient survival. Different markers have been used to analyze human MDSC subtypes in various clinical settings. Most studies concur with the observation that MDSCs express CD11b and CD33 but lack the expression of markers of mature myeloid cells, such as CD80, CD40, and HLADR (42). The accumulation of immature myeloid cells lin (CD3/CD19/CD56/CD14)−HLADR−/lowCD33+ in the blood correlated with the tumor burden, as well as with the stage of the disease in two independent studies (3, 10) that included diverse types of cancer. In addition, CD14+HLADR−/lowCD11b+, as well as CD14−CD15+HLADR−/lowCD11b+, MDSCs were described in patients with melanoma (4) or RCC (5, 37). We consistently observed similar phenotypes in our GC patients as well. In addition, we found another subpopulation, CD15+FSChiSSChi (Supplemental Fig. 1A), which is similar, but not identical, to a previously described CD15+ population: the CD15+FSClowSSChi population in RCC (37) and the two different CD14−CD15hi and CD14−CD15int populations in melanoma patients (43). IL-4Rα was also reported as a MDSC marker by Mandruzzato et al. (44). Because IL-4Rα seems to be a useful marker for MDSC phenotyping, we included it in our initial panel of markers, together with the ones mentioned above, in our first 15 GC patients. We found no difference between these two subpopulations of CD14+IL-4Rα+ and CD15+IL-4Rα+ cells in GC and HDs (data not shown). It must be noted that, although useful, this marker has yet to be validated in other cancer types. Another subset (CD11b−/lowCD16−), which was recently described in bone marrow–derived MDSCs, is equivalent to MDSCs present in the blood of patients with stage IV breast cancer (45). These populations display the structure and markers of promyelocytes and are immunosuppressive. The MDSCs in GC patients were phenotyped to be lin−HLADRlowCD14low/−CD15+CD11b+CD33+ and capable of suppressing T cell proliferation. Similar to GC patients, MDSCs from RCC (46) and nonsmall cell lung carcinoma (12) patients were also reported to be granulocytic and were CD15+CD14−CD11b. Unlike what was reported by Gabitas et al. (47) where they found MDSCs to make up just 1.5% of the PBMC population in cancer patients, our GC patients exhibited a significantly higher percentage of MDSCs (mean = 13.75%). It is likely due to the used of fresh rather than frozen PBMC in our study. When frozen PBMCs from GC patients were analyzed, we noticed that the granulocytic MDSC population was markedly reduced (data not shown). We found that MDSCs could suppress autologous T cell proliferation and IFN-γ production in a dose-dependent manner. The expression levels of TCR-ζ on CD8+ T cells were also observed to be downregulated in coculture assays with MDSC. These findings, together with the increased number of MDSCs in the peripheral blood, confirm the phenotypic and immunosuppressive functional characteristics of MDSCs in GC patients. The MDSCs in GC patients exert their suppressive effects through arg-I, although we did not note the presence of iNOS. In addition to arg-I, we show that S100A8/A9 plays a role in the immunosuppressive activity of MDSCs in GC patients. We and other investigators (29) showed that S100A8/A9 is upregulated in GC, although a role for these molecules in immune suppression in human cancer has not been demonstrated. We showed in this study that S100A8/A9 was expressed in both the malignant epithelial cells and in the stromal cells and that levels were elevated in the plasma of GC patients. We also showed that peripheral blood MDSCs from GC patients expressed and secreted S100A8/A9. This is in line with results from mouse models that demonstrated that MDSCs from both tumor-bearing and tumor-free mice produced S100A8/A9 proteins in an autocrine manner (35). There was a higher basal level of secretion of S100A8/A9 by MDSCs in GC patients compared with HDs (Fig. 4D). In addition, MDSCs in HDs showed a negligible increase in their secretion of S100A8/A9 upon coculture with T cells. This finding could be attributed to the pathological conditions in tumor microenvironments that resulted in increased secretion of S100A8/A9 in response to elevated intracellular calcium levels (25). Another possible explanation is that MDSCs in GC patients are activated to a greater degree by pathological stimuli; hence, upon interaction with effector cells, these MDSCs were able to better respond by enhancing S100A8/A9 secretion. We extended this observation by showing that, in addition to playing a role in the accumulation of MDSCs, S100A8/A9 plays a role in the suppressive function of MDSCs. We showed that blocking S100A8/A9 could reverse the suppressive activity of MDSCs on T cell function. 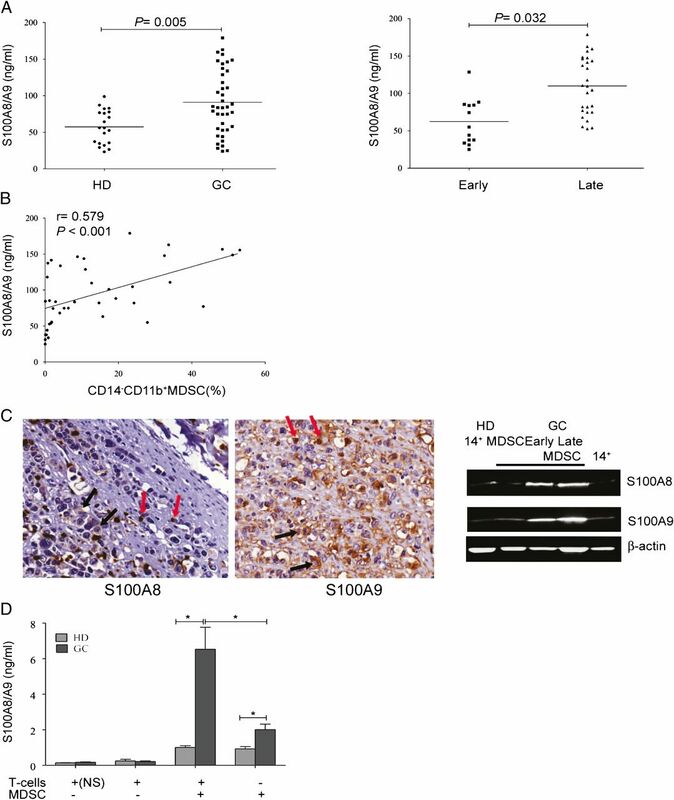 Indeed, multiple proinflammatory mediators, including S100A8/A9, IL-1β, IL-6, and PGE2 (6, 7), promoted MDSC accumulation and activation when secreted within the tumor microenvironment. In addition, blocking S100A8/A9’s binding to its receptor RAGE reduced the ability of MDSCs from GC patients to suppress T cell proliferation and IFN-γ production. Our results suggest that the S100A8/A9 produced by MDSCs (Fig. 4C, right panel) enhances their immunosuppressive effects by acting through RAGE. S100A8/A9–RAGE ligation is known to initiate downstream intracellular signaling in MDSCs involving NF-κB activation, as shown in mouse models (35). NF-κB activation, in turn, upregulates the expression of arginase, which helps to mediate MDSC suppression (35, 41, 48). This could explain the enhanced suppression of T cell proliferation mediated by MDSCs from GC patients compared with those from healthy controls that are possibly mediated by an enhanced expression of arg-I. Interestingly, CD14+ monocytes from GC patients also express arg-I (Fig. 3B). This is due to the fact that cancer patients are inherently immune-suppressed and, therefore, possibly have defective monocytes, such as alternatively activated monocytes. Indeed, alternatively activated monocytes were reported in human filarial infections (49). These cells are predominantly associated with secretion of regulatory cytokines, such as IL-10 and TGF-β, and are influenced by arg-I expression. In addition to examining the phenotype and function of MDSCs, we examined the biological significance of MDSCs in GC patients. We found that later-stage GC patients had higher numbers of MDSCs than did patients with stage I or II GC. The frequency of MDSCs in GC patients correlated inversely with patient prognosis. Furthermore, among the patients with stage III or IV GC, those with a higher frequency of MDSCs exhibited a poorer prognosis. Univariate and multivariate Cox proportional-hazards analysis showed that increased numbers of CD14−CD11b+ MDSCs were significantly associated with reduced overall survival in the cohort of GC patients in our study. We also showed that MDSC numbers in patients with metastatic GC are decreased when the tumor burden is reduced by cancer therapy. Our data suggest that MDSCs may play a role in the outcome of patients with GC. Our results suggest that MDSC numbers are positively correlated with cancer stage and with patient prognosis. Although we were unable to determine whether the increased numbers of MDSCs are the cause or the effect of human GC stage and survival, murine data suggest that reducing MDSC numbers may be beneficial to the tumor-bearing host (50–52). Our results showing the importance of S100A8/A9 and RAGE in human MDSC function could potentially present doctors with another pathway to modify the regulatory effect of GC on the host immunity. RAGE inhibitors (TTP4000) are now in clinical development for use in Alzheimer’s patients (Transtech Pharma). Other strategies, including RAGE–IgG fusion proteins (53), anti-RAGE mAb (54), and recombinant soluble RAGE (55), have been used to inhibit RAGE signaling in preclinical models across other diseases. All of these strategies have focused on the ligand–RAGE interaction without any consideration for ligand specificity. Given that the RAGE axis is central to the host immune response, strategies that target specific ligands that underlie disease pathogenesis in GC are more desirable than those that generically block receptor function. One such strategy may be to target the S100A8/A9–RAGE axis, because it promotes MDSC accumulation and suppression. It is not inconceivable that these inhibitors may one day be used as an adjunct in cancer treatment; clinical trials demonstrated the efficacy of anti–CTLA-4 and anti–PD-1 treatment in advanced cancer. In conclusion, we identified MDSCs in human GC patients and showed that they contribute to immune suppression. In a multivariate analysis, we found that MDSC levels increased with cancer stage and that higher MDSC levels correlated with lower patient survival. We further demonstrated that S100A8/A9, produced by MDSCs, plays a role in MDSC activation in GC patients, identifying S100A8/A9 as a potential target for GC treatment. These results add to our understanding of the immunobiology of GC. They may also be informative for future GC immunotherapeutic trials, which may need to take the immunosuppressive effects of MDSCs into consideration. We thank Lim Che Kang for help with flow cytometry and Dr. Lim Kiat Hon for help with immunohistochemistry. This work was supported by the National Medical Research Council, Singapore.
. 2007. Identification of a new subset of myeloid suppressor cells in peripheral blood of melanoma patients with modulation by a granulocyte-macrophage colony-stimulation factor-based antitumor vaccine. J. Clin. Oncol. 25: 2546–2553.
. 2005. Arginase-producing myeloid suppressor cells in renal cell carcinoma patients: a mechanism of tumor evasion. Cancer Res. 65: 3044–3048.
. 2009. Increased circulating myeloid-derived suppressor cells correlate with clinical cancer stage, metastatic tumor burden, and doxorubicin-cyclophosphamide chemotherapy. Cancer Immunol. Immunother. 58: 49–59.
. 2006. All-trans-retinoic acid improves differentiation of myeloid cells and immune response in cancer patients. Cancer Res. 66: 9299–9307.
. 2010. Population alterations of L-arginase- and inducible nitric oxide synthase-expressed CD11b+/CD14−/CD15+/CD33+ myeloid-derived suppressor cells and CD8+ T lymphocytes in patients with advanced-stage non-small cell lung cancer. J. Cancer Res. Clin. Oncol. 136: 35–45.
. 2008. A new population of myeloid-derived suppressor cells in hepatocellular carcinoma patients induces CD4(+)CD25(+)Foxp3(+) T cells. Gastroenterology 135: 234–243.
. 2006. Defective antitumor function of monocyte-derived macrophages from epithelial ovarian cancer patients. Clin. Cancer Res. 12: 1515–1524.
. 2004. Antigen-specific inhibition of CD8+ T cell response by immature myeloid cells in cancer is mediated by reactive oxygen species. J. Immunol. 172: 989–999.
. 2007. Arginase, prostaglandins, and myeloid-derived suppressor cells in renal cell carcinoma. Clin. Cancer Res. 13: 721s–726s.
. 2000. Nitric oxide-producing CD11b(+)Ly-6G(Gr-1)(+)CD31(ER-MP12)(+) cells in the spleen of cyclophosphamide-treated mice: implications for T-cell responses in immunosuppressed mice. Blood 95: 212–220.
. 2003. L-arginine metabolism in myeloid cells controls T-lymphocyte functions. Trends Immunol. 24: 302–306.
. 2006. S100A8 and S100A9 in inflammation and cancer. Biochem. Pharmacol. 72: 1622–1631. 2001. S100: a multigenic family of calcium-modulated proteins of the EF-hand type with intracellular and extracellular functional roles. Int. J. Biochem. Cell Biol. 33: 637–668.
. 2007. S100 proteins expressed in phagocytes: a novel group of damage-associated molecular pattern molecules. J. Leukoc. Biol. 81: 28–37.
. 2003. Phagocyte-specific S100 proteins: a novel group of proinflammatory molecules. Trends Immunol. 24: 155–158.
. 2000. Immunohistochemical investigation of migration inhibitory factor-related protein (MRP)-14 expression in hepatocellular carcinoma. Med. Oncol. 17: 183–188.
. 2008. S100A8 and S100A9 overexpression is associated with poor pathological parameters in invasive ductal carcinoma of the breast. Curr. Cancer Drug Targets 8: 243–252.
. 2003. Calgranulins in cystic fluid and serum from patients with ovarian carcinomas. Cancer Res. 63: 7507–7514.
. 2002. Gastric cancers overexpress S100A calcium-binding proteins. Cancer Res. 62: 6823–6826.
. 2002. The S100 family heterodimer, MRP-8/14, binds with high affinity to heparin and heparan sulfate glycosaminoglycans on endothelial cells. J. Biol. Chem. 277: 3658–3665.
. 2007. Mrp8 and Mrp14 are endogenous activators of Toll-like receptor 4, promoting lethal, endotoxin-induced shock. Nat. Med. 13: 1042–1049.
. 2008. RAGE, carboxylated glycans and S100A8/A9 play essential roles in colitis-associated carcinogenesis. Carcinogenesis 29: 2035–2043.
. 2001. Two proteins modulating transendothelial migration of leukocytes recognize novel carboxylated glycans on endothelial cells. J. Immunol. 166: 4678–4688. 2012. S100A8 and S100A9: new insights into their roles in malignancy. J. Innate Immun. 4: 31–40.
. 2008. Proinflammatory S100 proteins regulate the accumulation of myeloid-derived suppressor cells. J. Immunol. 181: 4666–4675.
. 2012. Multipeptide immune response to cancer vaccine IMA901 after single-dose cyclophosphamide associates with longer patient survival. Nat. Med 18: 1254–1261.
. 2008. 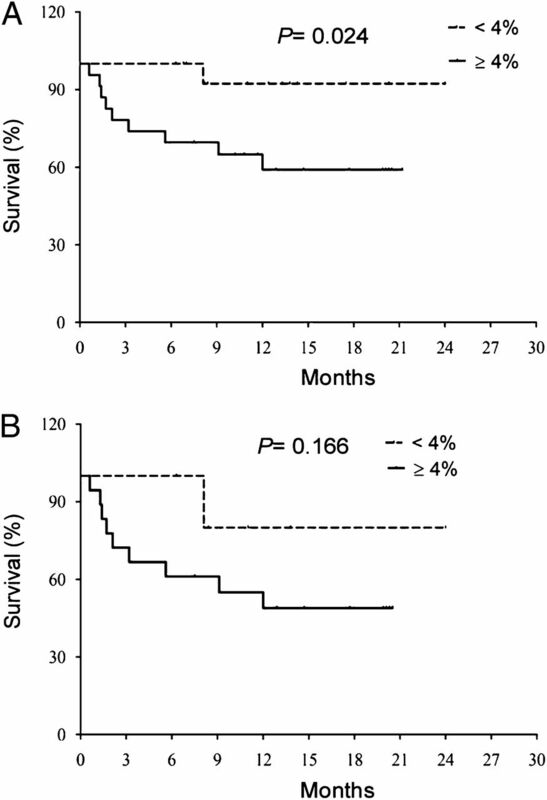 Reversal of myeloid cell-mediated immunosuppression in patients with metastatic renal cell carcinoma. Clin. Cancer Res. 14: 8270–8278.
. 2003. Gastric cancer epidemiology and risk factors. J. Clin. Epidemiol. 56: 1–9.
. 2006. Perioperative chemotherapy versus surgery alone for resectable gastroesophageal cancer. N. Engl. J. Med. 355: 11–20.
. 2012. Phenotype, function and clinical implications of myeloid-derived suppressor cells in cancer patients. Cancer Immunol. Immunother. 61: 255–263.
. 2012. Myeloid cells obtained from the blood but not from the tumor can suppress T-cell proliferation in patients with melanoma. Clin. Cancer Res. 18: 5212–5223.
. 2009. IL4Ralpha+ myeloid-derived suppressor cell expansion in cancer patients. J. Immunol. 182: 6562–6568.
. 2011. A human promyelocytic-like population is responsible for the immune suppression mediated by myeloid-derived suppressor cells. Blood 118: 2254–2265.
. 2009. Arginase I-producing myeloid-derived suppressor cells in renal cell carcinoma are a subpopulation of activated granulocytes. Cancer Res. 69: 1553–1560.
. 2011. Elevated myeloid-derived suppressor cells in pancreatic, esophageal and gastric cancer are an independent prognostic factor and are associated with significant elevation of the Th2 cytokine interleukin-13. Cancer Immunol. Immunother. 60: 1419–1430.
. 2011. S100A8/A9 activate key genes and pathways in colon tumor progression. Mol. Cancer Res. 9: 133–148.
. 2007. Alternatively activated macrophages in helminth infections. Curr. Opin. Immunol. 19: 448–453.
. 2003. All-trans-retinoic acid eliminates immature myeloid cells from tumor-bearing mice and improves the effect of vaccination. Cancer Res. 63: 4441–4449.
. 2003. Transforming growth factor-beta production and myeloid cells are an effector mechanism through which CD1d-restricted T cells block cytotoxic T lymphocyte-mediated tumor immunosurveillance: abrogation prevents tumor recurrence. J. Exp. Med. 198: 1741–1752.
. 2011. Beneficial effects of a novel RAGE inhibitor on early diabetic retinopathy and tactile allodynia. Mol. Vis. 17: 3156–3165.
. 2011. A monoclonal antibody against RAGE alters gene expression and is protective in experimental models of sepsis and pneumococcal pneumonia. Shock 35: 492–498.
. 2011. Septic shock is associated with receptor for advanced glycation end products ligation of LPS. J. Immunol. 186: 3248–3257.